255 games, 194 wins; 14 trophies out of a possible 19, including 3 La Liga and 2 Champions League titles. The statistics speak for themselves but do they speak for the manager? There remains a real mystique surrounding Pep Guardiola. This is a man who followed up a glittering playing career at Barcelona by becoming their most successful manager ever, all by the age of 40. Much has been written about his tactics (the false nine, tiki taka) and his players, but precious little about the calm, classy ‘Philosopher’ himself. This is largely his own doing; during his four managerial seasons at the Nou Camp, Pep refused all one-to-one media and all but one interview for publication. Another Way of Winning takes an end as its beginning, using Pep’s surprise resignation as the point at which to stop and reflect on his phenomenal career to date. 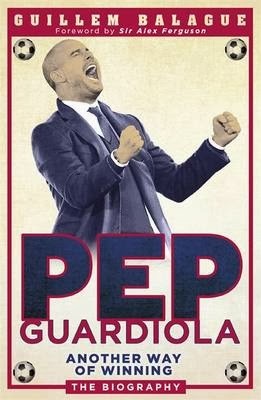 This is Pep’s Greatest Hits; there’s no filler in sight as Balagué takes us from the early successes of his playing days (6 La Liga titles, 1 European Cup, 1 Olympic Gold), through the glory years of No. 1 after No.1 as Barcelona manager (the coverage of the two Champions League finals in particular is incredibly detailed), before the inevitable tensions, rivals and disappointments, and finally the tearful goodbye and the new direction. What he may lack in eloquence and style, Balagué certainly makes up for in zip and punch. As with Arsene Wenger, Guardiola is presented as less a football manager than a football teacher, a genius with a singular vision for his pupils: ‘Total Football’ with a Spanish twist. Brave but ordered attack in the form of flowing, possession football, built upon a base of hard work and togetherness. But it’s one thing to have a philosophy and quite another to implement it successfully. Luckily, Pep had a largely receptive audience (most notably, of course, La Masía graduates new and old, from Xavi, Iniesta and Puyol through to Messi, Busquets and Pedro), and as Balagué demonstrates through a series of invaluable team-talk insights, ‘his ability to communicate is perhaps his greatest talent’. ‘The coach makes us understand football’, Gerard Pique corroborates. Many did, however, fall victim to Pep’s strict ‘my way or the highway’ policy. The considerable talents of Ronaldinho, Deco, Eto’o, Bojan, Yaya Touré and of course Ibrahimović were all shown the door; ‘the affection lasted as long as the player’s desire to be a part of the vision’. The Brazilian duo were rightly seen as a disruptive influence (particularly on a young Messi) but in discussing these last two players, Another Way of Winning for the first time questions Guardiola’s perfect judgement, and specifically his unyielding favouritism towards his home-grown talents. Talking of Barca’s ever-increasing reliance on La Pulga as the supreme focal point, Balagué asks, ‘Had Guardiola created a monster in Messi? The Argentinian had absolute power in the coach’s final season, and his behaviour was sometimes out of place.’ As they would soon find out against Chelsea, no matter how good Plan A is, you need a Plan B. The pressure to succeed took its toll on Guardiola, ‘that need to continue to fuel a competitive group under any circumstances’. What Another Way of Winning brilliantly captures is the sensitivity of the man. In the difficult transition from player to manager, Pep was keen to distance himself from the dressing room itself, but that didn’t prevent a deep ‘emotional investment’ in the lives of his players. As he himself articulates so astutely, ‘The closer I get to players, the more I get burned, I need to distance myself.’ But nowhere was Pep’s emotional fragility more evident than in his intense battle with Real Madrid manager and former friend Jose Mourinho. Balagué sums up their rivalry nicely; ‘Pep took it all personally. For José it was all part of the job’. With his mind games and barbed comments, the Special One wore away at Pep’s principles until he retaliated and soon afterwards surrendered. Mourinho may have outlasted his foe but a vulnerable genius makes for much more compelling reading.